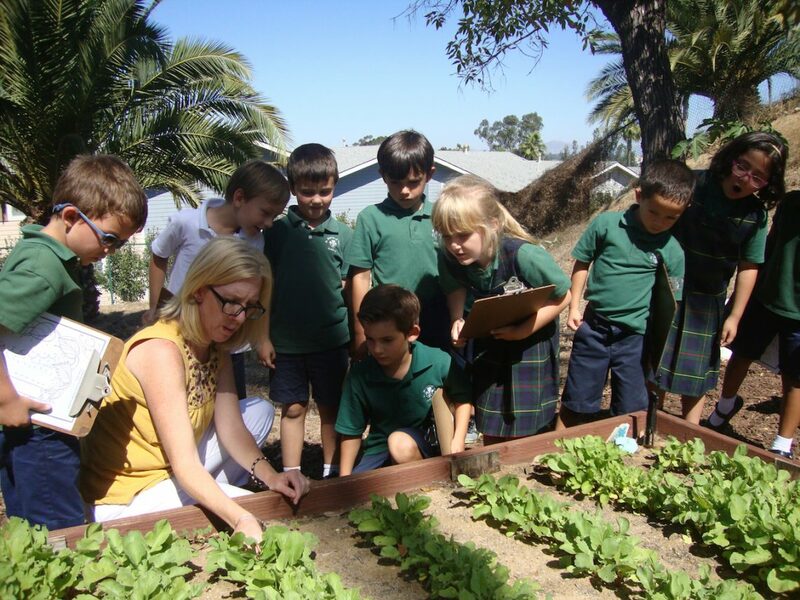 1st grade students learn about planting, growing and harvesting in the school garden. 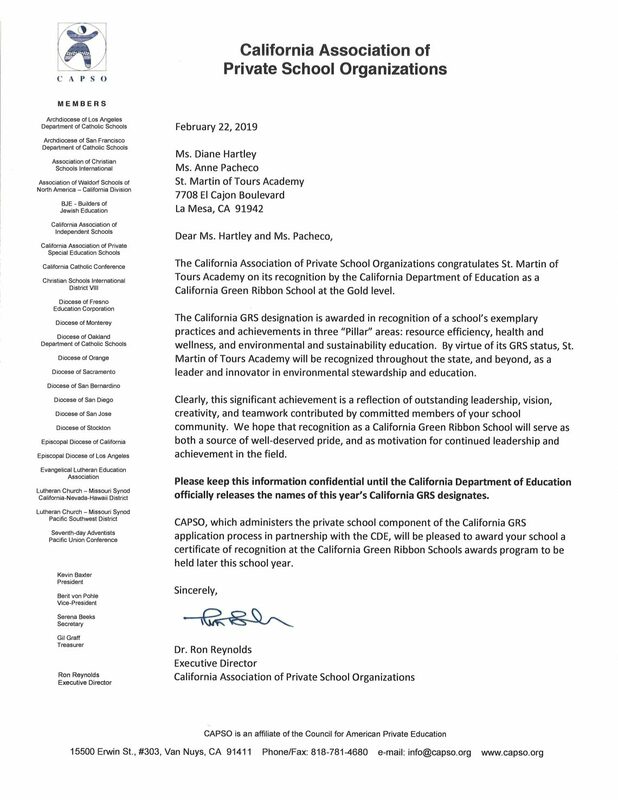 St. Martin of Tours Academy’s strong academic foundation and mission statement to “prepare students to become engaged citizens of the world and answer the call to service” supports a unified core commitment to reducing environmental impact, growing environmental literacy, fostering better health and wellness within our community, and ultimately guiding students to become lifelong learners and leaders as stewards of the environment. 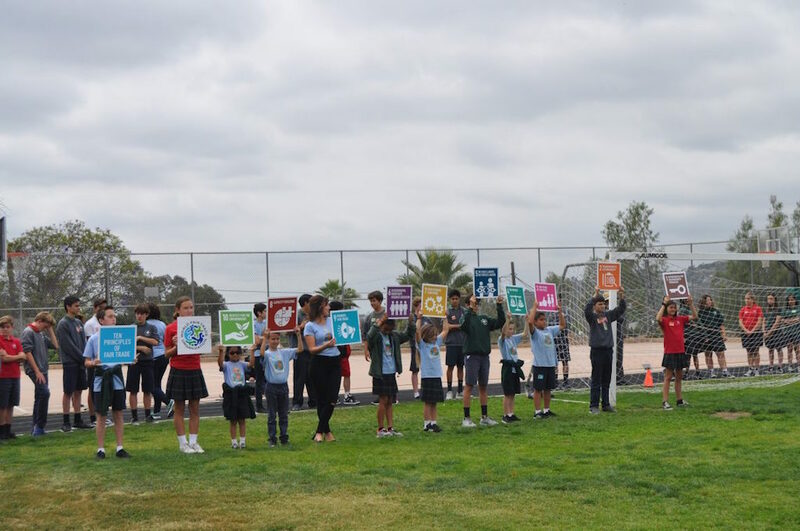 SMA has made the necessary commitments to reduce its environmental impacts through investments in solar panels, updated windows, energy appraisals, revised watering systems, drought tolerant planting, playground materials, roofing materials and lighting enhancements. 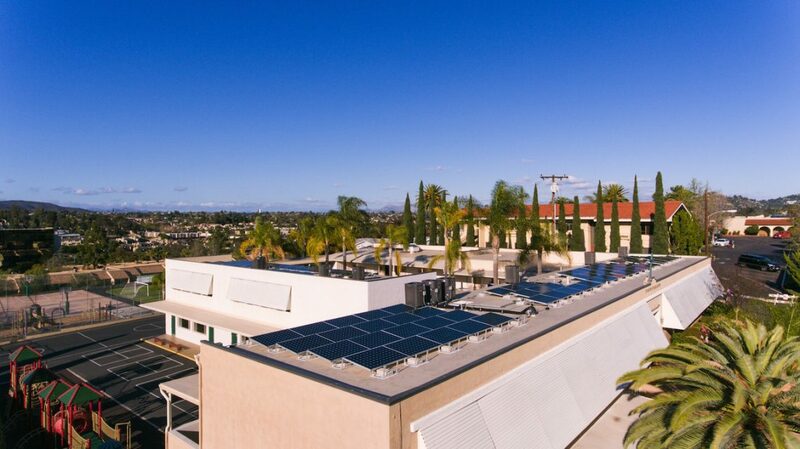 Modernization in 2018 included the installation of rooftop solar panels, which has been projected to offset 97.94% of the Academy’s power. Important window replacements in four classrooms with high energy performance, “Low-E” and solar control coating will improve thermal performance as well as enhance security. Primary playgrounds were upgraded in 2016 by replacing wood chips with TotTurf rubber flooring made from recycled tires to improve child safety. Upgrades from 2014 to 2016 encompassed an entire roof replacement with an Eco-friendly Firestone, Ultraply TPO material. 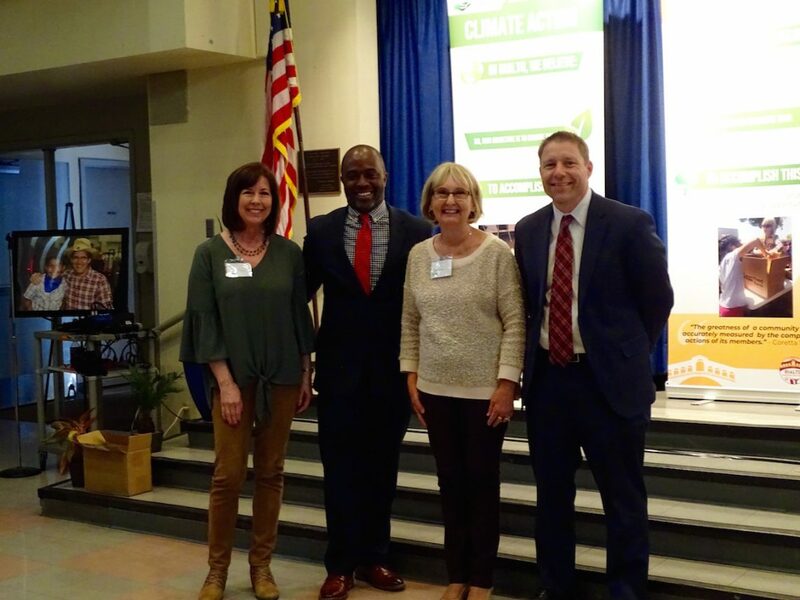 More efficient and environmentally friendly air and heating units were installed in K through 8 classrooms improving energy efficiency, air quality and noise pollution. SMA took part in an “energy audit” and light bulb replacement program through the local energy utility, San Diego Gas & Electric, which prompted campus improvements with regards to efficient, reduced energy usage, and education of staff and students on energy saving techniques and products. SMA understands the intrinsic value and connection that a healthy environment, nature and lifestyle has on student and staff health. The organic community garden, built on campus in 2016 by the staff and students, provides many opportunities for community outreach as well as environmental and life science curriculum goals. Students learned how to build and sustain an organic garden, and gained insight into fair trade principles. This once overgrown area now hosts community partnerships with the school, parish and the food assistance center. Academy leadership has improved health by evaluating and using safer cleaning products, thoughtful pest control practices, frequent use of outdoor classroom settings around campus, and continued focus on nutrition as part of school curriculum. St. Martin of Tours Academy’s method of teaching program, Pilon® Workshop Way® System of Education, promotes positive, healthy and respectful interaction between staff and students, which enhances learning opportunities, independence and wellness. Careful maintenance of a level field, full-sized basketball and volleyball court and track area enables a wide range of opportunities for physical and mental wellness, and camaraderie in physical education programs, sports practices, walks, annual staff versus eighth grade volleyball match and extended education areas. Nutritional education is supported by a “healthy snacks only” policy. 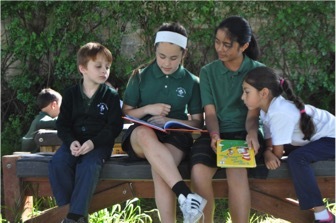 The academy recognizes birthdays through the Birthday Book Club, where students donate a book to the school library in lieu of parties or sweet treats. 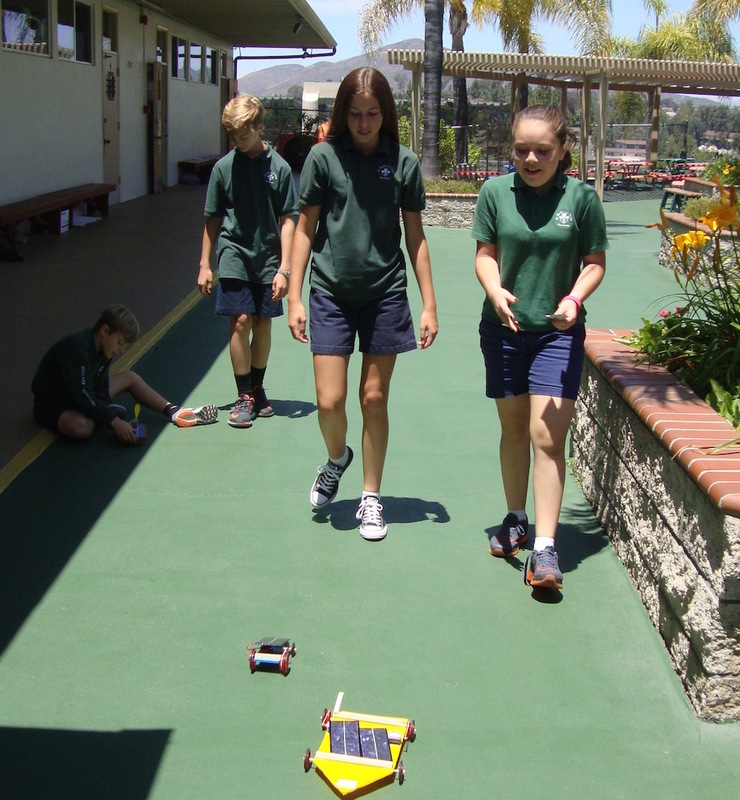 In sixth grade, students created solar powered cars in teams through Rokenbok Mobile Stem lab. School functions utilize recyclable and environmentally sustainable materials. Academy fundraisers are centered around physical activity, health as well as an appreciation and awareness of the environment and conservation. The walkathon fundraiser takes place at a local lake, with sponsored donations designated for campus facility improvements. Campus-wide recycling and paper consumption efforts are a cooperative effort. Academy newsletters are sent digitally each week, and PBA-free, reusable water bottles are encouraged for daily use. Students became “Agents for Change” using the Fair Trade Principles celebrating World Fair Trade Day. SMA is unique in the fact that students, staff and parents support fair trade principles throughout all aspects of the school. The school purchases fair trade soccer balls, t-shirts, coffee & tea. Products are environmentally sustainable, organic, and the workers or farmers are paid fairly and have safe and healthy working conditions. Fair Trade fundraisers are the norm. Instead of magazine sales, gift wrap, etc., parents choose products that support small farmers and artisans who make or grow products in developing countries in an environmentally sustainable way that protects the people and the earth. 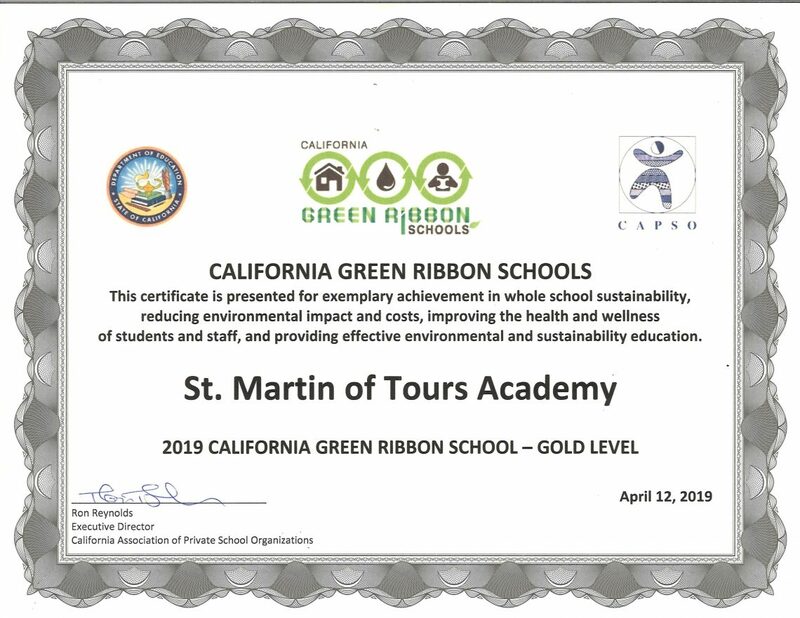 St. Martin of Tours has made great strides in reducing the environmental impact of our school. Our school has been a Pilon® Workshop Way® school for almost thirty years. The Philosophy that we have at St. Martin of Tours Academy goes hand in hand with improving health and wellness of students and staff. The curriculum we have in place follows California State Standards, Diocesan Standards, and is aligned with Common Core State standards. We incorporate STEAM/STEM standards across the curriculum which addresses, “Effective Environmental and Sustainability Education.” Our status as a designated Fair Trade School in 2015 supports our commitment to the environment and to the health and wellness of our own and other global communities.